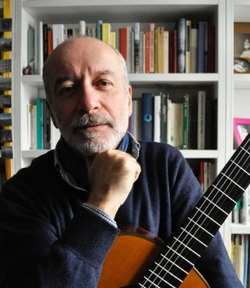 Maurizio Villa obtained his academic diploma in 1977 at the age of twenty and a year later he started his academic career as guitar teacher at national conservatories. First Potenza, then Salerno and finally at the Conservatorio San Pietro a Majella of Napoli. At the same time he continued to improve his musical education by attending several post graduate courses. Among these is the “Musical Biodynamic” course with Alvaro Company and the developmental approach in music teaching known as “Orff Schulwerk” In 2006 he obtained a special Master Degree in “Interpretation and Composition of Musical Disciplines”. As a musician worked with many Italian renowned visual artists, scholars, actors and playwrighters such as Edoardo Sanguineti, Roberto De Simone, Achille Bonito Oliva, Gabriele Frasca ed Enzo Moscato. Thanks to his prestigious collabora-tions, he begun performing in the main Italian theatres and festi-vals, participating to numerous studio and live recordings. During his career he devoted himself to the composition too (he wrote several works for guitars, piano, strings, organ, vibes, flute, percussion and electronics machines), and he formed and led many ensembles with whom he performed his own music. Maurizio Villa devised an innovative didactic methodology usable by students and by professionals alike: “Video Analysis of Music Performance”. The development of this methodology lead him to collaborate with the biomedicine faulty of the University of Ferrara in experimental researches crossing music and neurosciences.